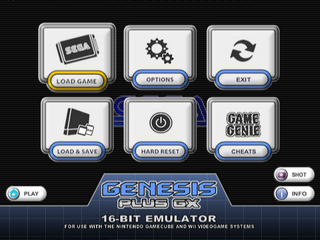 Genesis Plus GX, the Genesis Plus emulator for Wii made by Eke-eke, has been updated to version 1.5.0. See the change log below for what's new in this release. added support for Master System compatibility mode (Z80 ports access mode), incl. Mode 5 rendering. added Mode 4 rendering for both Genesis & Master System modes. added alternate BG planes rendering functions (should be faster on PPC architectures). added support for Master System compatibility mode (Z80 ports access mode). added Master System peripherals emulation (Control Pad, Paddle, Sports Pad & Light Phaser). added XE-1AP (analog controller) emulation. added support for all known Master System cartridge mappers. added copy-protection hardware emulation for a few MD unlicensed games: fixes 777 Casino (crash when talking to bunny girls). fixed Game Genie when several codes affect same ROM address. added Master System compatibility mode emulation (automatically enabled when loading ROM file with .sms extension). various code cleanup & comments. fixed cheat codes handling when several codes affect same ROM address. improved input controller detection on menu exit. compiled with latest libogc: improves USB compatibility & fixes stability issues with Wiimotes.